Do your Dubia roaches have mites? Want to get rid of them? If so, this post is for you. Mite infestation of captive tropical roach colonies is common for several reasons. First, cockroaches naturally attract mites. In fact, some roach species host specific mite species. The Madagascar hissing cockroach is a good example. They attract a mite called Androlaelaps schaeferi. As with most roach/mite interaction, their relationship is symbiotic rather than parasitic. Technically, the relationship is “commensal” (external link), which means the mites do not harm the roaches. In fact, the roaches may even benefit because the mites clear mold from their airways. Mite infestation in wild cockroaches tends to be mild and self-limiting. However, this is not necessarily true in captivity. If left untreated, mite infestation of captive roach colonies can be severe and destructive. In captivity, mites can actually harm roaches. This happens because conditions in your Dubia or other roach colony are different than those in the wild. High humidity, poor air circulation, abundant food, and a captive community of insects unable to escape to greener pastures all conspire to support conditions that can lead to a serious mite outbreak. This can have serious negative consequences. When captive roach colonies are overwhelmed by mites, females may drop their oöthecae and nymph hatch rates may drop. If the mite numbers are large enough, they can even kill roaches directly. That’s the bad news. The good news is that while Dubia roaches attract mites, they’re not associated with any particular mite species like the hissing cockroach. The Dubia roaches-mites connection is simply one of opportunity rather than some deeper biological directive that might be harder to deal with. The other good news is that Dubia roaches can live in conditions that don’t tend to attract mites. This means that the odds are good you can maintain a colony of feeders without suffering the annoyance of perpetual mite infestations. You may even be able to breed them without mites if you get the enclosure conditions just right. The bottom line in practical terms is that mites and captive Dubia roaches don’t mix, but they don’t necessarily have to. The following is the most effective way we know to clear a mite infestation and prevent re-infestation in the future. Because every situation is unique, some steps may be more or less important than others. In general terms, your mileage may vary. Gather the following items before you start. NOTE: There is one basic objective when trying to eliminate mites from a Dubia colony, and two steps to achieve it. The main goal is to rid the area of mites. Importantly though, you want to prevent them from re-establishing. This is critically important because in practice, you can’t kill all the mites. The mites themselves are often microscopic, and their eggs always are, but you can get enough of them to make a difference in their ability to rebuild their population. You may be able to prevent re-infestation entirely by changing the conditions that led to the problem in the first place. So the first step is to clean everything. Clean the roach bin, the roaches, the counters, floor, drawers…everything. The second step is to change the environment so it’s unfavorable to mites. If successful, any mites that remain after cleaning will die and the new environment won’t support their return. NOTE: All things equal, and in this situation, mites cannot survive without the roaches. They will die in a few days if left with just frass. Frass and paper-based harborage offer them shelter and make them difficult to weed out and remove, but roaches provide them with food. Keep this in mind as you proceed. Follow these seven steps closely. Remember, you don’t have to get all the mites. You want to take out as many as possible, but the key is changing the conditions in the colony from favorable to unfavorable. Reducing mite numbers will hasten their demise. Changing the environment will ensure it. Clear out the roach bin and clean it to remove as many mites and eggs as you can. Start by removing all the items. This includes food and water bowls, harborage, and food. Separate the roaches from these items, then separate the roaches from their frass. When you have just roaches, place them in a clean, fresh, empty container. Wash the bin you just emptied. Consider cleaning the bin and anything else that can be cleaned with a weak bleach solution. This is thought to kill mites and their eggs. Use soap if you don’t use bleach. Now is a good time to start separating clean things from those that have not yet been washed. This will help prevent re-contamination. If there are items that can be run through the dishwasher, do that. The heat will kill mites and their eggs. If not, scrub the items well with soap and water then set them aside to dry with other clean items. Mites don’t like sunshine and you don’t want to spread them around your home, so all the better if you can do the washing outside in the sun. Caution: Borax, tea tree oil, and “flowers of sulfur” are often used for mite eradication. These products are options, but we don’t recommend using them in or around Dubia roach colonies. They can be effective against mites but also against roaches. Certainly do not use these substances on anything the roaches may contact directly. This includes the bin, food bowls, and your hands. Tea tree oil residue will bother the roaches but Borax residue can kill them. If you try any of these remedies, use them only outside the colony on things the roaches will not contact. And use them only after you’ve cleaned the bin and its components, including the roaches. Also be certain to leave no residue behind. Borax residue can inadvertently contaminate your Dubia colony – even indirectly. While we don’t recommend these products, you should be aware that they are options. Next, throw away contaminated frass, harborage, and anything else from inside the bin that can’t be washed. Use a large plastic trash bag that you can close up and reopen as needed. Note that freezing kills some mite species but not others, so freezing your supplies is not an option unless you know which species your roaches are infected with. Given that there are almost 50,000 mite species, identification seems unlikely so freezing as an eradication method is probably off the table. Heat, on the other hand, kills all mites and eggs. Temperatures of just 122º F can kill 100% of mites in 20 minutes (external link). This means heat from a dishwasher, microwave, and oven will eliminate mites. Obviously though, be very cautious with this last one. To be safe, we don’t recommend putting anything in the oven. While it is an option, the easiest and safest thing is to wash items that can be washed and throw away disposable paper-based items and start fresh. NOTE: Insecticides or miticides like Dicofol are likely to also harm or kill your roaches, so we do not recommend using them in or near your colony. Yes, you’re going to “wash” the roaches. Grab the sieve, bowl, flour, and Ziploc bag. Put a quarter cup of flour in the bag. Add a handful or two of roaches. Shake for 10 or 20 seconds, or until the roaches are coated (and thoroughly annoyed). Place the sieve over the bowl, empty the bag into the sieve, and shake as much flour off the roaches as you can. Put the flour-coated roaches into a clean container and repeat this process until all the roaches are “clean”. While this may seem odd, flour does two things. First, it coats the mites and tends to prevent them from being able to hang on to the roaches. Second, it absorbs moisture and makes the environment less hospitable for them. Dubia roaches don’t like being shaken and coated with flour, but they’ll get over it. Mites covered in flour are likely to not be able to do the things they need to do to survive, so flour it is. NOTE: Some people have suggested using diatomaceous earth in place of flour. We think this is probably a bad idea. While the porous and abrasive fossilized diatoms do tend to kill tiny insects like mites, they can also cause problems in larger insects like Dubia roaches. These problems may include death. We recommend avoiding diatomaceous earth if you don’t want to risk killing your roaches. Regarding the sieve, it helps to have one with high metal or plastic sides so the roaches you’re shaking can’t climb out. Ideally, the lip should be at least two inches high. The roaches will do everything they can to get out of the sieve. Be prepared for this. A bucket or bowl with very small holes drilled in the bottom can be an alternative to a sieve. The holes need to be large enough for the flour to pass but small enough that you don’t lose the roaches. 1/16-inch is probably a good size. Alternatively, a compost filter with screen or fine mesh stretched across the base may also work. There are probably lots of different home-based ideas and contraptions that could help you separate flour and mites from roaches. When all the roaches are coated with flour, tossed, and separated, throw the used flour and Ziploc bag into the garbage bag and close it up tight. The roaches should all be in a new, clean container. Set that aside for now. Humidity is among the largest contributing factors in Dubia colony mite infestations. Mites need food and shelter, and they seem to respond favorably to heat, but high humidity really seems to set them off and support the infestation. Alternatively, mites do not tend to be a problem in the absence of high humidity in our experience. Best of all, if mites already exist, reducing humidity can help eliminate them and prevent re-infestation. As previously mentioned, you do not need high humidity or heat if you aren’t breeding your roaches. Room temperatures and average humidity work fine for maintaining Dubia roaches as feeders. If you want to breed your Dubia, raising the heat to between 80ºF and 90ºF while keeping humidity below 50% may help you avoid mite problems. For those dealing with mites, consider keeping humidity below 40% to start and see how that goes. 40% humidity is protective against mite reinfestation. 50% humidity may be safe too, but it may also be pushing the limit. Mites seem to be much more common in Dubia roach colonies kept around 60% humidity and above. Consider also that geography probably influences the likelihood of mite infestation in captive roach colonies. If you live in a place where mites are common, a lower humidity target of 40% may be safest to start. You can always raise it from there once you establish a safe baseline. If keeping colony humidity below 50% is not possible, you may be able to eliminate mites and prevent them from returning by turning off the heat and letting the room where you keep your roaches air out for a time. A day is probably sufficient. Try repeating this once or twice a week. The idea is to counter the high heat and humidity with periods of low humidity. This allows everything to dry out. Reducing temperature and humidity intermittently may work in some cases, but the most reliable way to reduce the risk of mite infestation is to lower humidity to a level below which mites can take hold and proliferate. After you’ve done all of the above, clean the room where you keep your Dubia colony. Make it spotless! Clean all surfaces with a sponge and a weak bleach solution. You can use soap if you prefer. Dry everything with towels. You can even wipe surfaces with 70% alcohol or a dilute Lysol mixture if you wish. Both can kill mites and their eggs and won’t harm roaches after they’ve dried. When you’re done, microwave any sponges that you cleaned with for at least one minute. Hopefully you don’t keep your Dubia colony in a carpeted room. Mites find refuge in carpet and other fabric, and once they do they can be difficult to extract. Carpet is also not particularly well suited for humid environments. Moisture can accumulate via condensation on the wood substrate or carpet padding. Mold can grow, and this provides both food and a breeding ground for mites. If there is carpet in the room, vacuum thoroughly and consider moving your colony to a room with solid flooring. If you have any area rugs, clean and remove them, and consider not putting them back. Throw everything you wore, used, and got near into the laundry. Before handling the roaches, it might be wise to shower, change your clothes, and quickly wipe down the room one last time. You could even vacuum adjacent rooms to get some mites that may have jumped off to other places while you cleaned. This may not be necessary, but it’s something to consider. Again, it’s not necessary to get all the mites and eggs because you made (and will make) the conditions in your Dubia colony inhospitable to them. Whatever mites remain will die in a few days, and with a little luck (and planning), they will never return. How did mites infest your Dubia colony in the first place? That’s a good question, and knowing the answer can help you avoid mite problems in the future. Regarding mites and roaches, moisture is key. Avoid standing water as much as possible. If you use water crystals or sponges for hydration, let them dry out between replenishment. Consider washing them often with a method that will kill potential pathogens. Better yet, try rotating them. It is a good idea to choose the watering method least likely to lead to problems like mites. Or perhaps less likely than the one you use now. 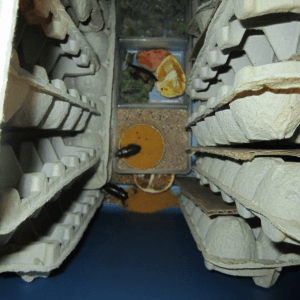 Consider learning a bit about Dubia roach hydration or updating your knowledge and/or your current method if it has been a while since you visited the subject. Store vegetables and fruits that you feed your roaches in the refrigerator. Don’t leave them out on the counter for long, and always wash before offering them to your roaches. Also remove any remaining “wet food” from the bin after a day or two. This especially includes roach chow that you may have supplemented with water or juice. Wet roach chow can become a breeding ground for mites, so check your colony often and replace old food with new. You can also alternate wet food and dry every few days. When throwing away left over food you’ve removed from the colony, either send it down the disposal or wrap it tightly in a plastic bag before throwing it in the trash. Mite eggs hatch in around 7-10 days. Keep this in mind. Replace things often that tend to stay wet within the colony. This could mean alternating paper-based harborage like egg crates if high humidity is unavoidable. Either throw out used harborage or let it dry thoroughly in the sun before reusing. You can consider the mite hatch time and your colony’s propensity to attract mites in deciding how often you should do this. Don’t bring plants, soil, compost, trash, or similar material from outside into the room or space where you keep your Dubia roaches. Certainly don’t place any of these things inside the bin with your roaches. Mites come from the outdoors. They’re often found in soil, plants, and other moist things. The fewer opportunities you give them to establish a presence, the less likely they will be to do so. So that’s basically it. In summary, you can rid your Dubia roaches of mites by cleaning thoroughly and changing the conditions that led to the infestation and establishment of the mites in the first place. You may be able to prevent their return by creating an inhospitable environment and by reducing the colony’s exposure. How to get to this place is fairly simple. It may not always be easy, but it is straightforward. Removing mites from dubia roach colonies can be a little or a lot of work depending on how many roaches you have, but we think most people have a good chance of success with this method. With a little planning and effort, it seems reasonable that mites don’t have to be a fact of everyday life in the keeping and even breeding of Dubia roaches. Thank You So Much for posting this article. It’s 3am, I just took a magnifying glass to the “weird little tan specks” all over the bins. When I realized what they were, I felt completely without hope. All I could think of was “how do you kill bugs on bugs?”. You have given me hope, knowledge and confidence. I can’t thank you enough. Your directions are easy-ish, straightforward and do-able. THANK YOU!!!!!! Thanks for writing all this out! I’ve never had this problem before, but I do now and am working through the flouring the roaches (which is taking a long time as my colony in in the 1000s). But I was wondering what some other options are if lowering the humidity to 50% is impossible, as the humidity outside is 93% where I live right now and I can’t turn off the heat because it is only 46F outside and I have reptiles and tarantulas to worry about as well. The answer might just be ‘do the flour thing, clean where the roaches were kept, move them to somewhere with more air flow and hope for the best’ which is what my current plan is, but I was curious if there was something else I could be doing. I think you have the right idea. Moving them to a location with more airflow and seeing what happens with the mite situation sounds like a good option if there aren’t any others. You might also consider keeping fewer roaches in each bin, keeping them free of frass or at least not letting it build up, and removing any paper or cardboard that might absorb moisture. I don’t know how effective these suggestions might be, but mites are bad for both reptiles and roaches, so it might be worth a try. I just ran into this problem. I killed all my dubias & started over. People seemed ignorant to what would have caused this. I am even on a insect breeding page on Facebook. I went to a reptile expo today & bought more supplies. I have no idea where the mites started but I do know I have high levels of humidity. I also just drilled holes in the top vs using screen. Lesson learned high humidity leads to mites. I’m giving it another go but if it reoccurs I am done.